Bread pudding is the perfect fall dessert--now more than ever. Football is entering its baroque phase with rules piled upon rules; clocks that advance, stop, reverse, have seconds added and taken away; bizarre jargon in place of plain speech; and endless reviews of video. The whole enterprise screams out for something simple as a counterbalance. Something rustic. Something that calls to mind a time when if it looked like someone fumbled the football, then he fumbled the football. 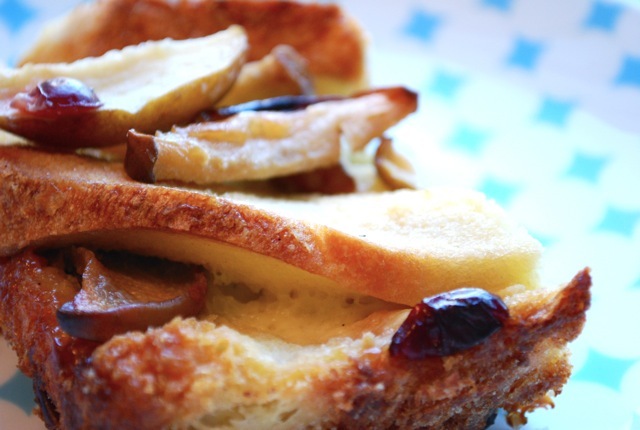 Something like bread pudding with apples and dried cranberries. Brian brought back these opalescent golden green apples from the farmers' market. I thought about pie, or even another tart, but bread pudding seemed like the way to go. I loved plum pudding so much I wanted to see if I could make a festive bread pudding with fall flavors. The plum pudding had a considerable tang, whereas this version features the quiet tones of vanilla and apple. I also cut way back on the sugar, which gives the flavor of the actual cream a voice. Preheat the oven to 400 degrees. Cut the apples into 1/2 inch slices. Scatter in a large baking dish somewhere around 9 x 13". Drop bits of butter all over, scatter the cranberries, squeeze the lemon all over, and give the pan a few shakes. The American Golden Russet apples we used were quite sweet, so I did not use any sugar in the roasting. If your apples are tart, sprinkle a tablespoon of sugar over the apples. Put into the oven and roast for 15 minutes until the apples are just bubbly. Let everything cool a bit, then pull the apples and cranberries out of the pan and set aside. Meanwhile, cut the bread slices so that each half slice will stand about 4 inches high. Butter the slices and set aside. Use a ton of a butter or just a little, it's up to you. Add a little more butter to the dish the apples were cooked in and arrange the bread so it is overlapping and at an angle (see below). Tuck the bits of apples and cranberries throughout. Slowly pour the custard over the slices. You want the bread to be almost completely covered, so add a bit of milk if you need more liquid. At this point, if you have the time, I strongly suggest you set the dish aside for 20 minutes to an hour--keep a close eye on it so you can add more liquid as it is absorbed.